This exhibition explores the various uses of animal images in medieval manuscripts. 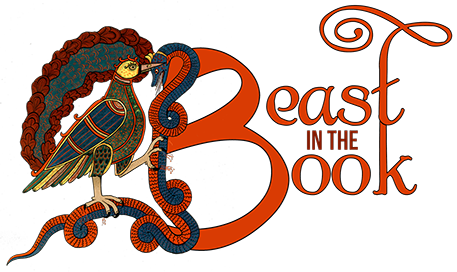 From representations of real animals in The Book of Beasts to the purely decorative animal borders of The Book of Kells and the weird and wonderful grotesques of the Luttrell Psalter, the Beast in the Book encourages you to reflect upon the ways in which the illustrators combined high art and imagination along with didactic messages. How did the text inspire illumination, and how did illumination further evolve the text? Considered here too are some of the animal images employed by medieval Christian, Muslim and Jewish illuminators to symbolize fundamental concepts within their own faith and culture. Compare how key ideas such as immortality, good and evil, and the nature of social relations are shared and differentiated using animal imagery, as well as the ways in which animals are sometimes used to represent the other. The manuscripts included are all in facsimile and are from the George A. Smathers Libraries’ Rare Books Collection, the Isser and Rae Price Library of Judaica, and the Cairo Genizah Collection at Cambridge University Library. In the 19th century increased scholarly interest in medieval history led to a demand for access to important works in manuscript. This demand encouraged the development of manuscript reproductions, or facsimiles. While consulting the original object was of great importance to the book historian, an accurate facsimile enabled the study of content, layout, script and illustration without the need to consult the manuscript itself. The publication of a facsimile often signified an important milestone in the scholarly evaluation of the work as the facsimile was usually accompanied by an extensive introduction or companion volume consolidating the wide ranging research conducted on the original to date. Furthermore, the production of facsimile editions not only promoted wider access and greater scholarship, they also helped preserve the originals from the wear and tear caused by excessive use. This exhibition, featuring facsimiles of major works in manuscript, demonstrates how facsimile technology has evolved over time. Compare, for example, the crude and fading photographic plates of The Book of Kells (1920) to the stunningly realistic reproduction of the Barcelona Haggadah (1992) with its parchment weighted paper, gold leaf illuminations and faithful copying of the original manuscript’s flaws and stains. Notwithstanding the quality of facsimile reproduction, the aim remains the same: to facilitate scholarly and public access to and appreciation of unique manuscripts sequestered in libraries and other institutions around the world. The online exhibition is based on the exhibition of the same name that was presented at the University of Florida George A. Smathers Libraries, January 12 - March 6, 2015.